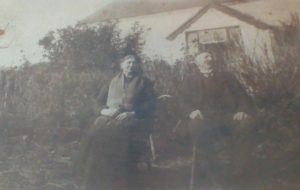 A lovely picture from Mick Fleming's collection - His grandparents, Mike Davy Fleming & his wife Hanora Scott at the Fleming homestead at Curracity. This fine 'Grand' house still stands today and in those times it would have been an exceptionally grand building indeed. Hanora Scott died on 15/07/1938 aged 68 as reported on her death cert. Mike Davy apparently lived to the age of 91. Mike Davy was born C1863 (Census Data) and while his death cert states his age at death was 80 years, this seems incorrect as he died on 21/01/1954. This fabulous picture was taken at the Fleming Homestead at Curracity. Mike Davy's grandson Jimmy Fleming, Joan Daly Fleming and their Family, live there at Curracity today. Mike Davy's Father David Fleming who married Catherine O'Connor was the first Fleming to live at Curracity. This David was born at Curraross to John Fleming and Mary Nolan Fleming in 1826.